On the screen, the red blobs move, trailing green, rope-like tubes as if they’d just escaped some evil captor. It’s a stunning image that’s at the heart of Gia Voeltz’s work, which not only has upended the way scientists think about our cells but also has implications for the understanding of neurodegenerative diseases like Alzheimer’s, ALS, and Parkinson’s. Now Voeltz is one of a select few who have been awarded an $8 million Howard Hughes Medical Institute grant, which will allow her to delve more deeply into the secrets our cells hold. 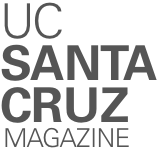 Currently a professor of molecular, cellular and developmental biology at Colorado University Boulder, Voeltz came to UC Santa Cruz from New York intending to become a medical doctor. Then, she joined Distinguished Professor of MCD Biology Manuel Ares’s lab, which was focused on RNA research, and found her home. Voeltz continued her RNA work at Yale University, where she got her Ph.D. But a funny thing happened. During a seminar lecture, a Harvard Medical School biologist mentioned that no one really had any idea how an organelle called the endoplasmic reticulum (ER) actually formed. Voeltz thought that was a cool question. In introductory textbooks, ER is described as an interconnected system of membranes that looks like a stack of pancakes inside the cell and is involved in lipid and protein synthesis. Voeltz knew little more than these basic ideas, and she spent the next few days reading everything she could find on ER before stepping completely out of her field. Using state-of-the-art equipment at her lab in Boulder, Voeltz discovered that instead of a stack of pancakes, the ER “had a beautiful architecture” that was more like lacy coral with other organelles hanging from it as if they were Christmas ornaments. Not only that but other organelles were communicating through the ER. This unexpected discovery spurred her forward, and she found that ER also seemed to clamp onto mitochondria and endosomes and clip them in certain spots, which is important because these organelles can play a role in human disease. “As soon as something gets surprising, that’s what I want to work on,” says Voeltz. UC Santa Cruz professor of ecology and evolutionary biology Beth Shapiro was also selected as one of this year’s Howard Hughes Medical Institute investigators. Read the story.